Yesterday, Shiner went to visit her favorite veterinarian for a check-up. It wasn't her idea of a fun Saturday... Shiner never liked going to work with me when I was a Veterinary Technician, and times have not changed since then I guess. She must have a special doggy vet sense, because she trembled during the whole car ride there. Once we got there, she inspected the waiting area and said hello to our old receptionist friend. She sat on the bench next to me. After a while, she got weighed in - 55 lbs. Then we went to the room and waited to see the doctor. 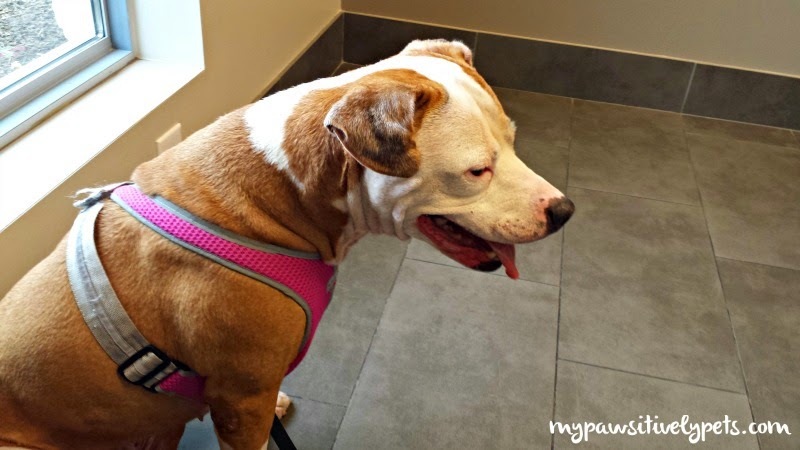 When we saw the vet, I asked her lots of questions about Shiner's care and health. Here's a list of important questions we asked our vet during Shiner's check-up. You should ask your vet questions during your pet's check-up as well. What vaccines does my pet need? Find out what vaccines your dog needs if you don't already know. Shiner received a Rabies and Leptospirosis vaccination. I like getting a Lepto vaccine because it is prevalent in our area. We declined the bordatella because she is not around other dogs very often. What is that lump? Many older pets sometimes get lumps and bumps. Most of the time, they are benign skin growths or tumors. But sometimes they can be cancer. Shiner has a bump on her rear hip that the veterinarian says we should keep an eye on. What is a good diet for my pet? I talked to Shiner's vet about the food I am feeding her right now. (More on that tomorrow, by the way.) She let me know what she thought of the food and said that it was OK for Shiner to eat. Does my pet have good mobility? Again, something that a senior pet owner might want to ask about. Shiner is 11 years old and hasn't had many significant orthopedic problems in her lifetime. The vet is impressed with her mobility and says her arthritis is very minimal. How are my pet's teeth? Shiner's vet looked in her mouth and examined her teeth. Shiner's teeth are OK for a senior dog, but she does need one tooth extraction. It is something we will have to save up for, because it is very expensive. Shiner also got her yearly heartworm test, which was negative and some ear medicine for her ear because she has an infection. And I'm very pleased that Shiner was well-behaved at the vet's office. Many times, Shiner likes to growl at strange people there. She's not fond of strangers sometimes, and she just wants to let them know this. This time, she was very nice and didn't growl at all. I think it was because of the nice Vet Tech, she must have liked him. And while a few other doggies were pulling away at their owner's leashes in the waiting area, she stood next to me like a good girl and waited for me to pay. The other lady said she was "jealous" of her. Good job Shiner, you make me a proud doggy mom! There are lots of other important questions you might ask your vet when you visit for pet check-ups. Let us know what important things you like to discuss with your pet's veterinarian in the comments. Thanks for a great post! I always give Easy an "extra check-up" before we go to the vet. I mark the area where I discovered "something" ( or the area I think "something" could be there) with a little piece of tape. And I always ask for the shots we need and those what we can skip (I'm not a fan of combined vaccines). I think that's great Easy. We know our dog's best, and little lumps or skin marks could easily be missed. I skipped Shiner's combined vaccine too, because I don't feel it's necessary at her age. A good vet should check for all this himself. I heard so many stories about pets being taken to the vet and hear they're in perfectly good health, only to pass away several weeks later for a cause that could have been avoided. Definitely Vanessa! Still, an exam cannot tell you every little thing about your pet's health. Sometimes, you need things like bloodwork, U/A, and other tests to really get the full idea about their health. I'm always leery about stories like that, because they don't tell the full story. What kind of tests did they decline the first time? It's also the pet owner's responsibility. We see our pets everyday and know the most about them. Those are great questions and we are sure glad Shiner is doing well, and that the Vet visit is over! Good questions, I'm glad everything went well! I really need to keep this in mind; often times as soon as I leave I remember something I meant to ask. I'm glad everything went well, Shiner did a good job. I am sorry to hear about her tooth. I love ger face in the first photo, it pretty much sums up a dog being concerned. I do the same thing! Since my vet is also my friend (that I haven't seen in a while to boot) I could probably sit in there and talk to her forever. But she's a busy woman and I know I can't take up all of her time. It's probably a good idea to write all of this stuff down. #3, 5 & 6 are HUGE for us! People know dogs get lumps - and frankly they do more frequently than cats. But kitties can get'em too! And teeth - holy cat. That's sooo important. We are prone to bad teeth, over here, and so we're watched closely and have regimens in place in addition to annual dentals! Yea, dogs do get them more often for sure. But, when we find them on cats it is more concerning I think. Glad you guys are watching those chompers! 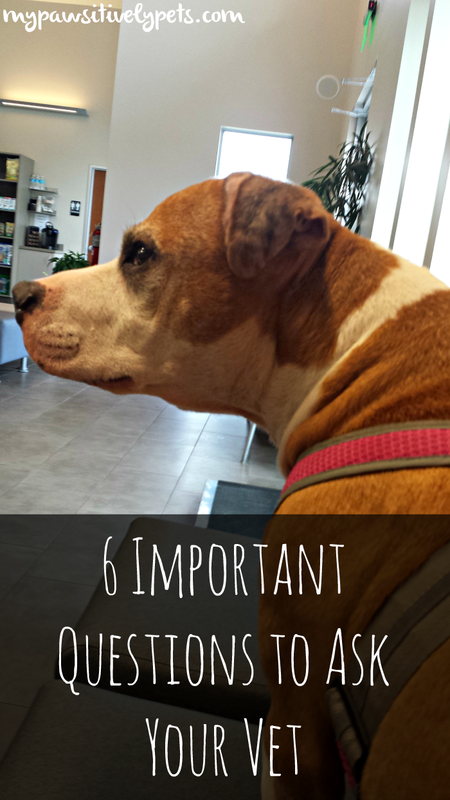 Great reminders - it's always a good idea to be prepared when you go to the vet. I keep a list of questions I want to ask and when our next appt comes around...I try to remember to bring it. Shine is such a good girl! This is a great reminder to prepare before going to the appointment. Annie has yer yearly exam in a few weeks so I need to remember consider what I'd like to know and be prepared. I'm glad to hear Shiner's heart is doing well. Pierrot also has a heart murmur. I also like the question about mobility. Great post! Well, I hope his heart murmur is no big deal like Shiner's. Cats can be a little different in that department though. I learned a long time ago not to freak out too much about the murmur thing... my daughter had one when she was young and it scared the heck out of me. But it turned out to be nothing. Good questions. Wally needs to go to the vet soon for his annual exam so we'll remember to ask these. We discuss healthy weights, titers vs minimal vaccinations, and Bruce's medication. Thanks for these suggestions. All excellent questions! Titers are important to ask about if you are not wanting vaccines. I try to keep ours at a minimum. Most vets aren't well trained in nutrition, and often defer to the nutritionists at what ever pet food company brand they are selling. If you feel the need to speak to your vet about nutrition, try to keep brand names out of it.. ask what specifics you should look for and why. That's a good tip! I know a lot of people say that, and it may be true for some vets... but I don't know, they did go to college for 8 years. I trust them over my own Nutrition knowledge. Great questions to start off especially for relatively new pet parents who have never owned a pet or taken them to the vet! How's that harness working out? Looks so cute! Lookin' good, Shiner :) I often ask my vet about Maya's mobility. Labradors are prone to arthritis so I make sure they check her over really well. She's always gotten a thumbs up, especially for her teeth. Pierson's teeth are another story. They can't look at his because he has to be muzzled. I know his teeth look terrible, despite brushing them every day.